Company’s New and Innovative Active Gaming Product, Called Dogfight Fitness Flight Simulator Selected as a Presenting Finalist from More Than 400 Product Idea Submissions. Product Receives Strong Reviews from Silicon Valley’s Top Venture Capitalists, Angels, Executives, Prospective Customers and Media. Mountain View, CA (PRWEB) June 17, 2009 — Electronic Sports, a leading industry provider of competitive active gaming machines that make working out fun, announced today the company was selected as a presenting finalist from over 400 product idea submissions at the Launch: Silicon Valley 2009 event held June 9, 2009 in Mountain View, California. Electronic Sports was one of only 30 companies worldwide invited to present their product, called Dogfight Fitness Flight Simulator, to venture capitalists and company executives in attendance at the prestigious event. This is the perfect venue for meeting smart, qualified partners who can really help us achieve our mission of making fitness fun. 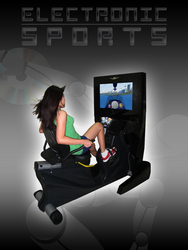 Dogfight Fitness Flight Simulator is a full-featured flight simulator interfaced with a high-end recumbent exercise bike that is designed to give the user a wide-variety of workouts ranging from moderate to intense exercise. Dogfight boasts exciting game play while simultaneously immersing the user in stunning graphics and sound; users typically don’t even realize they are getting such a great workout while using the simulator. Electronic Sports presented their product roadmap at the event to a group of several Silicon Valley Venture Capital Partners including Claremont Creek Ventures, Morgenthaler Ventures and HighBAR Ventures. The presentation detailed the product functionality, technology and the company’s future plans. Electronic Sports was the only company selected as a finalist in the Active Gaming and Fitness sectors. The Launch: Silicon Valley 2009 event, co-presented by SVASE, Garage Technology Ventures and hosted by Microsoft, provides the next generation of emerging technology companies with the opportunity to pitch their products to, and network with, an audience of Silicon Valley’s top Venture Capitalists, Angels, corporate business development executives, prospective customers and partners, bloggers and media. This is Electronic Sports’ first year of participation in the event. A copy of the company’s presentation is available for download at http://investors.electronicsports.com/. Electronic Sports is creating a line of physically challenging and competitive Active Gaming machines to make working out fun and interesting. By using an online social network, Electronic Sport’s next generation exergaming platform will facilitate physical competition and interaction between players anywhere in the world while promoting health and wellness. The company’s premier product, the Dogfight Fitness Flight Simulator, is now available for sale. The Dogfight can be purchased at Exergame Fitness USA‘s official website.